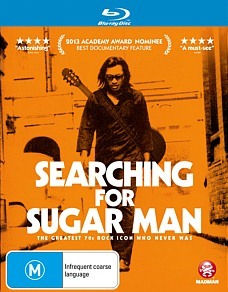 Search for Sugar Man Blu-ray Review To go into any more depth is to spoil the surprise, but with a brilliant soundtrack, lush cinematography and a couple of eminently worthwhile bonus features, Madman have certainly done a brilliant job of bringing this unmissable doco to local shores. Four years in the making and winner of the 2013 Academy Award for Best Documentary, Searching for Sugar Man combines all that’s best about the documentary genre - diligent research, heartfelt subject matter, an inherent air of mystery - into one of the most well-rounded and uplifting films of the past year. 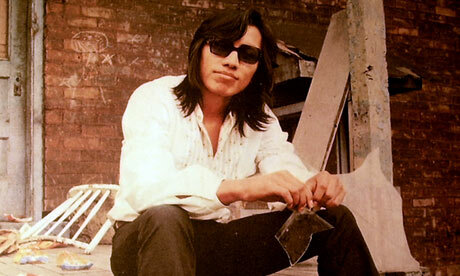 The movie charts the apparent disappearance of musician Sixto Rodriguez, who produced two little-known folk albums in the early 1970s before fading into obscurity. Rumours abounded of his apparent onstage demise - one telling had him pulling out a gun and committing suicide before a shocked audience, and in another more lurid version he set himself on fire as an apparent protest against his poor album sales and lack of recognition. Rumours of his demise notwithstanding, Rodriguez’ albums Cold Fact and Coming from Reality were surprise sleeper hits in apartheid-era South Africa, where their drug- and freedom-fuelled counter culture anthems struck a chord with a population living in enforced subservience to a racist police state. Determined to tell the story of the greatest 1970s rock icon that never was, Swedish filmmaker Malik Bendjelloul teamed up with a pair of avid South African fans to determine exactly what had become of the man who sold an estimated 500,000 records in that country alone, but about whom seemingly nothing was known. The end result is a startlingly engaging portrait of a musician who abandoned his craft at the height of his powers, and an all too familiar tale of record company chicanery, lost royalty checks and the uneasy relationship between art and commerce. To go into any more depth is to spoil the surprise, but with a brilliant soundtrack, lush cinematography and a couple of eminently worthwhile bonus features, Madman have certainly done a brilliant job of bringing this unmissable doco to local shores.